Shopping for men’s fashion in Second Life can be punishing, can’t it? Events that start out aimed at men get taken over by women’s fashions. Lack of clothing available for your favorite mesh body. It’s hard to even find a decent beard set to wear (shoutout to Wavie Haller for coming through with Valiant, though). You start to wonder if you should just switch to a female av instead. Or maybe you’ve got an SO who doesn’t want to/is terrible at dressing himself. You’re tired of this guy looking like he crawled out of 2010; he needs to update his av asap. Well, never fear! 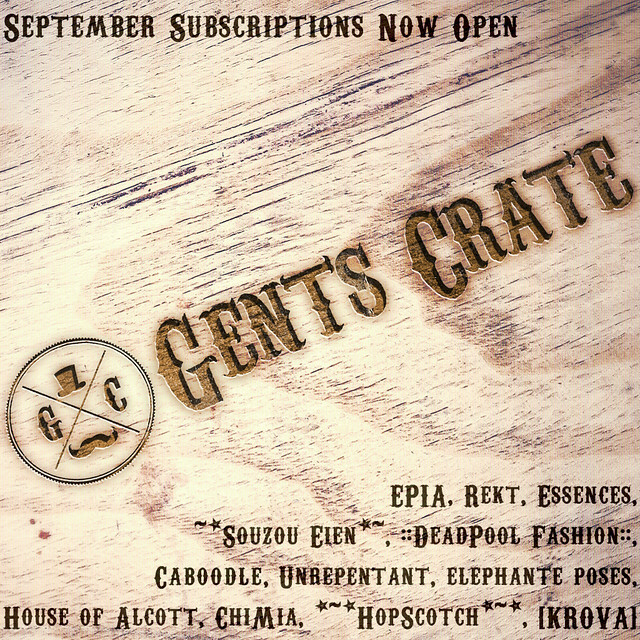 Gents Crate is here. See this? It’s a fab new thing called Gents Crate. It’s a monthly subscription service, delivered to you or your guyfriend’s lap. You pay 1000L and get all these fantastic goodies–you don’t even have to drag yourself or your loved one out to go shopping. No avs to derender, no laggy event decor. Just unpack and you’ll have a nice haul of stuff to wear every month. It isn’t just fashion, either! There’s decor pieces and furniture included to fix up your SL home. If you ask me, it’s a great deal. Subscriptions close in 9 more days, so join the group while you can!